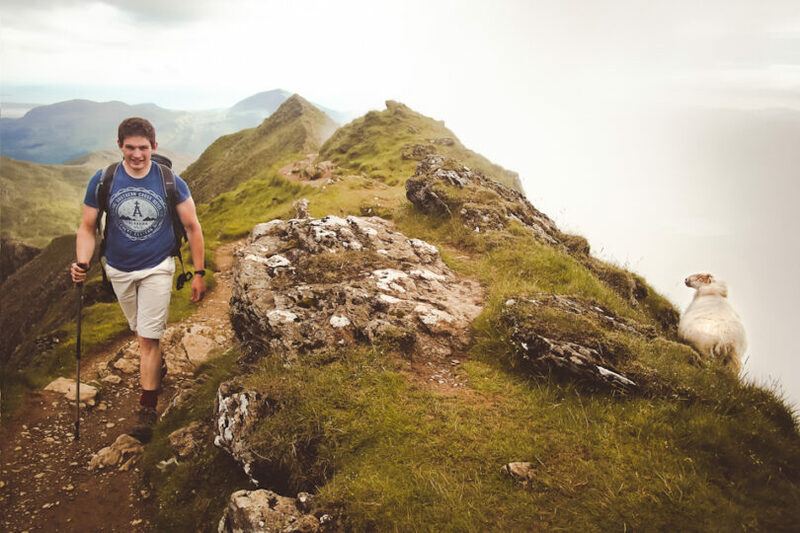 Hiking can impose a significant tax on your body, and getting some support to ease your passage along the tough sections of a trail can be a splendid idea. 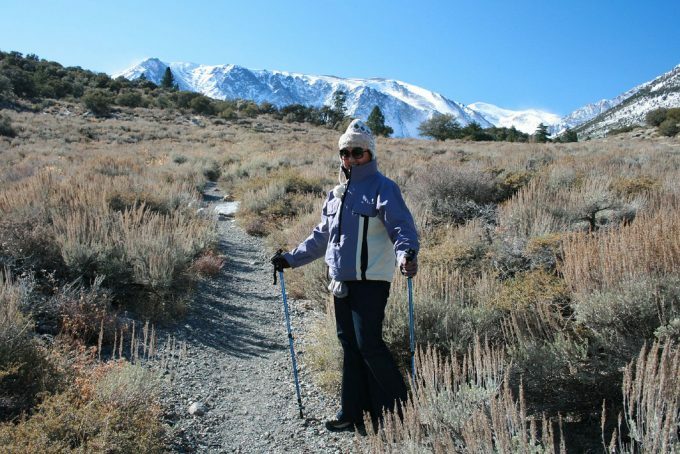 If you believe that hiking poles are for older people, or is just excess equipment, you may be pleasantly surprised to find that the best hiking poles will provide a much more pleasant and rewarding hiking experience. 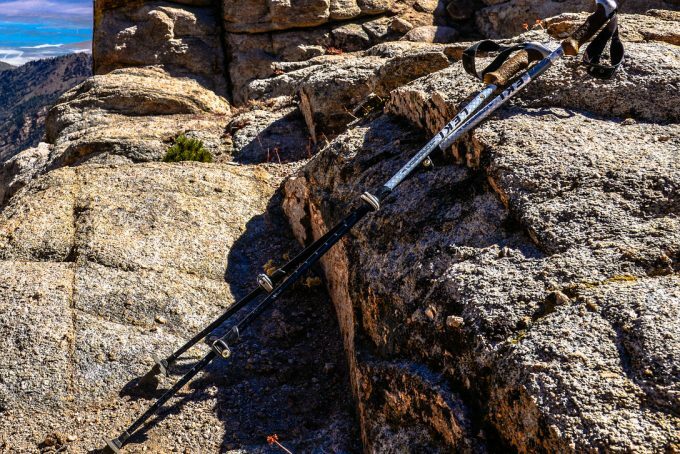 Here in this article, we are going to give you all of the information you need to know on getting the best hiking poles by telling you what features to keep an eye out for, as well as giving you several reviews of the best hiking poles on the market. Finding the right poles will help you hike better and will be comfortable to use. Read on for the important facts and features that will help you decide! Choosing a hiking pole set is not as easy as it sounds, because there are a lot of features to look into before you purchase. Please read on to see those important features in order to be more educated before you go shopping. You can choose from fixed-length or extendable hiking poles, with extendable hiking poles being vastly more popular. 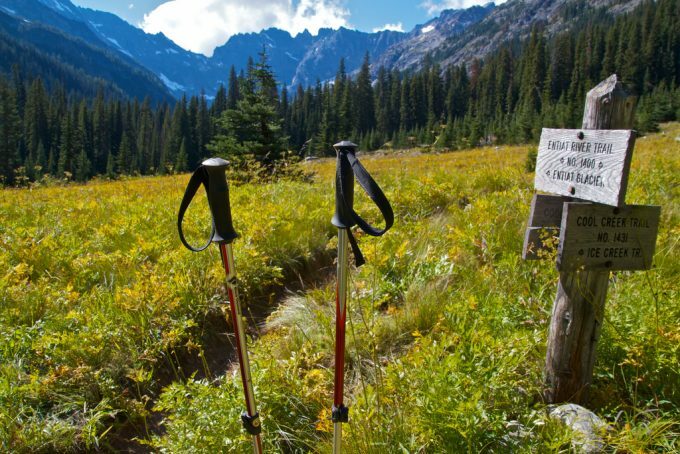 If you fold hiking poles down to their minimum, you can pack the poles in a suitcase or backpack until you need them. You can choose from twist lock, ez-lock or flick-lock mechanisms. All extension locking mechanisms are not equal, and you should be careful to tighten the locks to the maximum after you adjust the length. If your hands are weak or sore, ask someone to assist to make it as safe as possible before you get to a spot that is very hard to overcome without putting a lot of extra weight on the hiking pole. There is some give-and-take between weight and strength. Carbon fiber is incredibly light and durable, but more rigid than aluminum, and under certain conditions, carbon fiber could snap rather than bend if exposed to a weight more than its rating. Aluminum is heavier but stronger. The weight of your hiking poles could be critical, not only because you may need to carry it on your back in a rucksack in some remote spot, but because when you use a hiking pole you are trying to distribute strain amongst several different muscle groups – you should not be using half the strength of your arm muscles just to lift the poles into the air to take another step forward. There is an extensive debate about whether cork, rubber or nylon makes the best handles for hiking poles. Plastic handles are likely to become slippery when your hands sweat. The consensus is that the best hiking poles have rubberized, EVA foam or cork handles, to provide a more secure and comfortable grip. Cork should absorb most of the moisture and remain slip-free, while rubberized handles are reliably easy to hold on to but may be more abrasive. However, cork is heavier, and when used in combination with heavier aluminum, the result is a strong, but heavy hiking pole. You will therefore usually find that manufacturers use EVA grips on aluminum poles, and cork grips on carbon fiber poles. Some users report that they experience more blisters from using rubberized grips, but your overall comfort is a subjective experience. If you are worried about developing blisters on your hands, you could consider wearing gym gloves for extra padding on the palms of your hands. 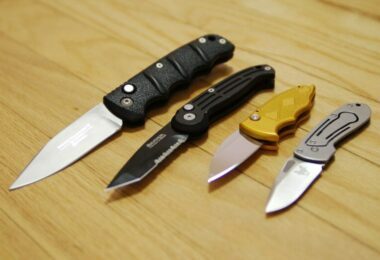 There should be no sharp edges, and the grip should comfortably fit either hand. Test the grip with gloves and bare hands. You should be able to clean the handle with a damp cloth. Rubberized, foam and cork grips make hiking poles kinder to your hands and more comfortable to use; whether you are pushing against them going uphill, or leaning on them going downhill. Wrist straps let you use your hands freely without having to put the hiking pole down first. Many people are prone to dropping or losing their poles, and wrist straps help to keep your equipment “on hand”. The wrist strap adjustment mechanism is designed to tighten with the natural pressure of your hands as you walk. Look for broader straps that are padded or lined to ensure day-long comfort, especially when you are sweating or exposed to wet conditions. Tungsten Carbide tips provide excellent traction under most normal conditions, but if you need a little extra grip, vulcanized rubber tips can assist you on slippery surfaces. We have now come to the section where we will show you several reviews for your consideration. Please check these over to see what features each has, so you can decide what you like and would feel most comfortable with. Specific features: The FlickLock Pro dual security affords super easy adjustability, even when wearing gloves, which can be a distinct advantage in icy weather. The flick-locks open and close smoothly, and won’t need to be re-adjusted during the hike. Simply flick open the lock, set the length and flick the lock closed – even while wearing gloves. Best use: For hikes where weight and very fast adjustments may be critical such as Alpine hiking. Particularly suitable for long-distance hikers. Description: The interchangeable extra-long carbide screw-off tips are easily replaceable. 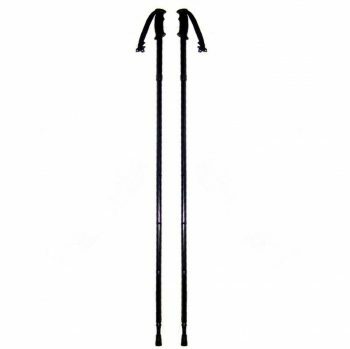 Although the rubber tips are sold separately, a Black Diamond Alpine Trekking Pole includes low-profile trekking and powder baskets for use in muddy conditions or in snow. 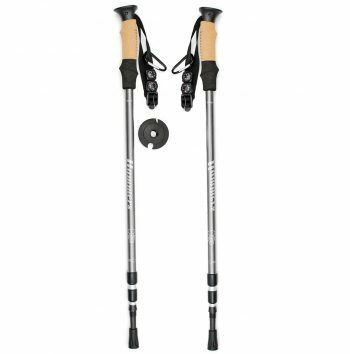 The Black Diamond hiking poles are not cheap, but are extremely easy to adjust, light, very reliable and superbly comfortable on long hikes. The wrist straps are wide 360-degree Nubuck straps that are padded for comfort so that your hand or arm never rubs against the nylon portion. And the extension mechanism is the FlickLock Pro Dual. The carbon fiber construction includes the ability of vibration damping, which makes it easier to trek. The grip is a premium natural cork grip with dual-density top absorbs sweat and will retain integrity in a variety of conditions and weather. The non-slip EVA Foam Grip extensions allows for secure choke-ups. Overall, this is a solid set of poles. Related: The Black Diamond name is synonymous with top quality outdoor products of almost every description for outdoor use. Their climbing, hiking and skiing equipment is very well known and most fans of the outdoors own at least one of their products. You could also investigate the newer version Black Diamond Alpine Trekking Pole. Specific features: There is a handy clip to link two poles to keep them together when not in use. 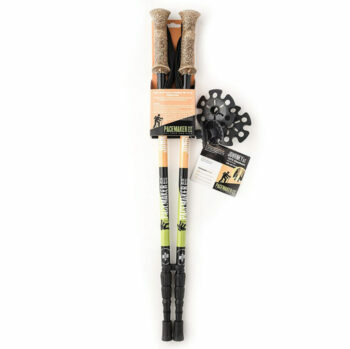 Best use: The design makes these hiking poles suitable for most ventures, including long hikes. The comfortable grip is an excellent introduction to hiking with poles for novice hikers and are popular with many adventurers. 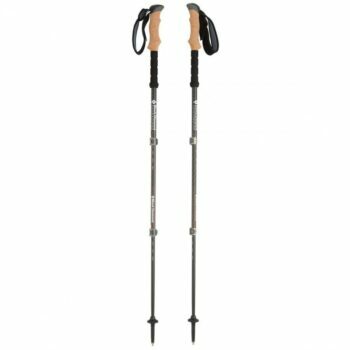 Description: Montem Ultra Strong Trekking Pole comes with standard steel tips, replaceable rubber tips and a set of mud baskets for soggy terrain. Rubber is better because it sticks to the ground more than steel. 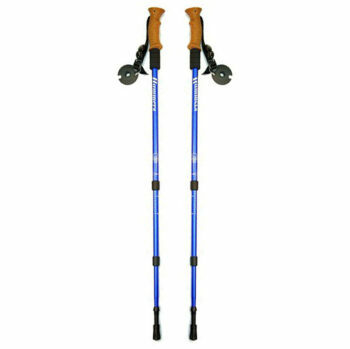 The trekking poles are strong, sturdy, and work on all surfaces. The grip is comfortable and the EVA foam handles conform to your own grip and are claimed to be stronger than cork, though not as absorbent. As an added feature, the foam extends down the pole for secure grip adjustment when hiking uphill. Adjustment clamps with measurement markers and screws with wide grooves for easy adjustment in the field with only a pocket knife is the type of mechanism used. The adjustable Nylon wrist straps are lined to reduce chafing – superb when hiking over long distances with flared ends. Overall, this set of poles does a great job and are worth the cost because of the high quality! The Montem Ultra Strong poles are very strong, but not the lightest product, although the EVA foam grip compensates. Related: Montem is another well-known name in outdoor products and they also manufacture an Ultralight Carbon Fiber Pole which combines an EVA foam grip with a carbon fiber shaft. It may be worth looking into if you will concentrate exclusively on Alpine hiking, though the locking mechanism is harder to secure while wearing gloves. Specific features: Detachable mini thermometer, compass and carabiner link and an ornamental carbon fiber imprint on the top section. Best use: Hiking under most conditions, though care must be taken to tighten the telescoping mechanism properly if you will be putting a lot of weight on it. Description: The Anti Shock Telescopic Trekking Pole has an excellent internal spring-loaded anti-shock mechanism inside can be turned on or off by twisting two sections. A Carbide tip with a rubber end cap for walking on rocky surfaces, and mud and snow baskets for different conditions is included. The extension mechanism has telescopic sections for adjustment to the length and a twisting section for tightening, while the grip is a contoured cork grip with added non slip EVA Foam Grip extensions for adjusting your hands when hiking uphill. The light weight and durable construction make these poles easy to take to any type of terrain. You can remove the mudguard as well as the spike cap and use it bare for the duration of your outdoor adventure. You will have to make sure that the twist lock is tightly locked in place or you may notice one stick getting shorter than the other. All you have to do to fix it is readjust the pole and then ensure it is firmly locked in place. Tips edges wear down fast. Related: The Hammers Collapsible Wading Staff Fishing Stick is aimed at people spending a lot of time in river country, wading swift streams with a very efficient double-shock corded spring action and is – handily – operated with only one hand! Best use: Excellent for all users, including long hikes and in places where the weight of your equipment really matters. Description: Carbon Fiber is a natural anti-shock material that reduces vibration and retains its strength over wide temperature ranges. The Bearios Carbon Fiber Quick Lock Pole comes with a carry bag and offers a rugged Carbide tungsten steel tip and extra rubber tips, snow and mud baskets and 2 Connectors. The extension mechanism is a hard plastic “Quick & Easy“ Lock similar to the Black Diamond FlipLock system, easy to adjust when wearing gloves. As far as the grip goes, it is a natural cork grip with good shock absorbing properties and added non slip EVA Foam Grip extensions. Slightly padded, adjustable nylon straps are comfortable when using. Overall, these poles are designed nicely, light in weight and made of highly durable carbon fiber that lasts a long time. While the screws might be a little hard to lock in, you will want to make sure everything is tightly fastened so that your poles do not slowly adjust smaller. Related: You will be using your Bearios hiking poles a lot, and will need replacement tips from time to time. Mud and snow baskets are sometimes lost in the excitement of the outdoors trip, but have no fear: the Bearios 4 Seasons Accessories Pack. 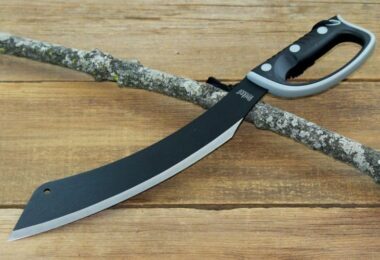 Best use: Great for using as an alternative for a walking stick and a good hiking pole for an economical price. Advanced hikers may prefer a better locking mechanism. Description: The spring-loaded anti-shock mechanism on Hammers HP5 Anti Shock Hiking Pole can be turned on or off with a twist of two sections. The Carbide tip hidden inside the rubber end cap is excellent for non-slip walking on rocky hard surfaces and a snow disc is included for use on loose top soil or muddy road. The Extension Mechanism is a Twist-and-Lock mechanism, and the grip is a large, ergonomically designed cork handle, providing all-day comfort. Wide nylon straps and EVA grip for the stick when folded are the type of wrist straps included. The telescopic pole has 3 sections and can go from a small 29 inches to a length of 60 inches with ease. The poles also come with a thermometer and a compass, and the carbide tip is waterproof. Plus the design is nice and colorful, so it is not easy to lose in the snow. The cork handle is nice, but is not as water absorbing. Related: The Hammers Collapsible Wading Staff Fishing Stick provides one-handed opening with a bungee cord design to make sure all the pieces stay together, this aluminum stick with EVA grip will add stability when you are in swift water, with great grip on slippery rocks. Dimensions: Folds to 12” and is adjustable to a maximum of 53″ in height with 5 1” height adjustments. Construction: Three aluminum alloy shafts with grommet inserts for additional strength. Specific features: This hiking pole folds up very small for packing in luggage. Best use: Day hikes or general daily use as an alternative for a walking stick. Description: The Folding Collapsible Travel Hiking Trekking Pole comes with a Carbide steel and a removable rubber hiking protector tip. A water-resistant PVC stuff bag is included, as are mud and snow baskets to prevent the poles from sinking into softer material. Sturdy on relatively flat surfaces and graduated ascents. The extension mechanism is a snap and release mechanism, and the grip is a ergonomic rubber handle to fit a wide variety of hand sizes. The wrist straps are easy to adjust and are non-slip. This hiking pole is not practical for people shorter than 5’4” and not the strongest design on the market. Advanced hikers who need strong leverage should consider a sturdier design. Overall, this pole set is pretty good and is especially compact and easy to take anywhere and carry. It makes walking not only easy, but wading in the water or going on fishing trips. While it only comes in black, it just adjusts from 49 inches to 53 inches total. It will fold down to the small size of 1.5 x 5.5. x 12 inches, which is easy to store in your tote if you need to. May not be able to take through airport security. Related: It is great to know that you can get replacement tips as needed. It’s a sound idea to always keep some extra pole tips at hand with the Hiking Trekking Pole Replacement Tip Set. Best use: Good for first-time users, although there is no separate anti-shock mechanism other than the natural give in the design. It is better for short hikes. Users with weak joints should probably consider a pole with better anti-shock features. Description: The strong aluminum pole features replaceable Tungsten tip ends, removable Vulcanized “extra life” rubber feet and a set of mud baskets. 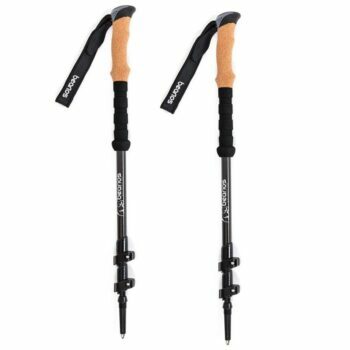 The PaceMaker Stix Anti Shock Trekking Pole compares well with more expensive brands. While there is an Antishock tip, it can be hard to trigger, and the friction locks can be hard to use. However, the cork grips are comfortable to use and the poles are light in weight and easy to carry. They work on all types of terrain and the straps can be adjusted to you for a secure hand grip. Overall, these poles work well, and stand up to their claim. The price is affordable and they are sturdy and fun to use for people of all ages! Some people have even used these at tent poles, though they are not intended for that. 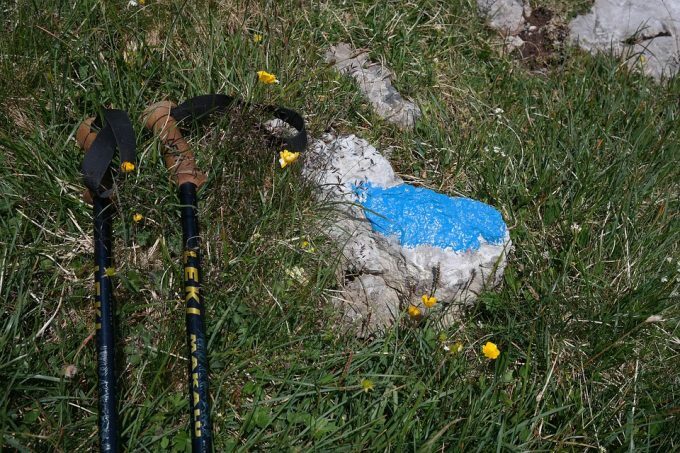 Users state that the poles are well built and help them on their hiking and camping journeys. 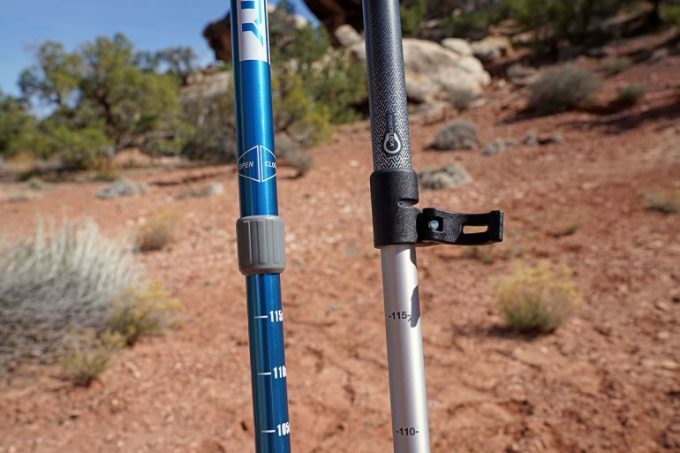 Related: The PaceMaker Stix Carbon Fiber AT-6 Trekking Poles are lighter than the “Journey” aluminum sticks and the lighter weight is also due to the EVA grips and are thus not optimum for very hot, sweaty conditions, but if weight really matters, these can be considered. Construction: Made in three parts with a carbon lower shaft to make it lighter, and an aluminum upper shaft for extra strength. Specific features: The Leki Carbon Ti Trekking Pole is uniquely manufactured using a combination of carbon fiber and aluminum. This combination provides higher strength without the extra weight of aluminum. Best use: A top of the range hiking pole for all terrains and all users. 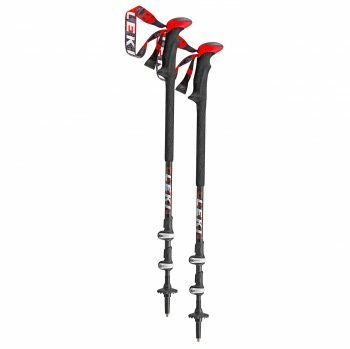 Description: The carbide tip sticks on the LEKI Carbon Ti Trekking Poles to slippery stones and the vulcanized rubber foot holds on to flat surfaces. The screw-on trekking baskets keeps the pole from sinking into soft ground. Extremely lightweight but very sturdy and very easy to adjust with a comfortable textured strap and grip that will wick away water and sweat. The extension mechanism is the Leki SpeedLock 2 adjustable system that secures your chosen pole length, and the grip is the Aergon Thermo Grip for more versatility on steep terrain. Then you have the wrist straps, which are Carbon Ti air-textured strap wicks moisture and dries quickly. Overall the poles are light in weight, strong and can be used as poles to set up a tent or a shelter! The locking mechanism is great, according to users, but you just have to pay attention to the tension of the quick locks. Related: The Leki range of outdoor products, also need no special introduction as they manufacture very useful high quality outdoor gear. They also make the Leki Corklite Trekking Poles which have a SAS-L Antishock on the lower shaft to help you negotiate steep downhill grades with confidence. If you hike regularly or on demanding trails, we highly recommend a set of sturdy hiking poles. While it can be tempting to purchase the cheapest possible product, you should consider whether your life may one day depend on the strength of the pole and the reliability of the locking mechanism. If you have to lean heavily on your pole to conquer a particularly tough patch, imagine for a moment what could happen if the pole was to snap or – more likely – the locking mechanism was to give way. However, most hikers seldom venture into places where a single pole can make a life-and-death difference. Most hikers simply use their hiking poles for an easier and more enjoyable time during a hike in the outdoors and don’t need the best hiking poles that money can buy. Whichever hiking pole you choose, we know you will find the use of a good hiking pole one of the simple pleasures of outdoor experiences. 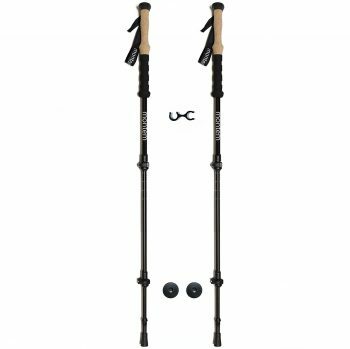 What type of hiking poles do you have? How have they worked for you? Please tell us your thoughts and comments in the Comments Section below, as we love hearing from you! And remember, you can share this post on social media so your friends can read it, too!